As sobering as that video is, it’s not too late to correct the problem. Talk to your kids, no matter their age. And on the opposite end of the spectrum, there’s these gals at Lumberton High School in Texas. 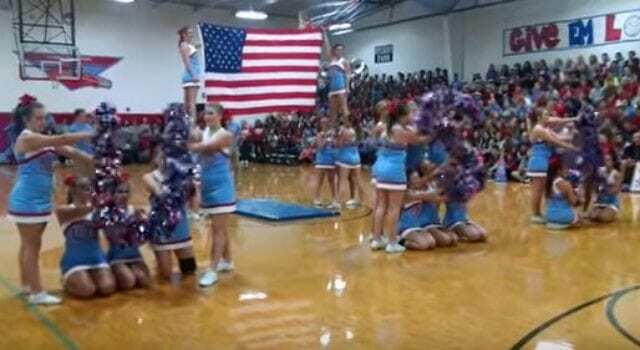 Each year since 9-11 the cheerleading squad has done a 9-11 tribute performance choreographed to the song “God Bless the U.S.A.” In addition to the song is audio of actual 911 calls placed that day recounting the horrific events. Anyone who sees and hears their routine will be impacted. And they will get a sense of the historic significance of what took place on 9-11-2001. These young ladies are passing on to the next generation the importance of never forgetting what happened to us as Americans that fateful day. This year, however, it was recorded to share with the rest of America and has come under attack. Take a look for yourself. Let me know if you see the controversy that some people are claiming they see. Personally, I don’t see the inappropriateness of this video. I just see a group of girls using their talent to honor those who died in a national tragedy. And in the process… they’re teaching others an important lesson… 9-11 history. Good for them! Previous articleIs saying ‘God bless you’ when someone sneezes on campus the next microaggression? Next articlePolitical Correctness is Ruining America!